Galen Central knows that there are a lot of people who love to discuss USC basketball, even during the offseason. To help our fellow USC basketball fans out, we’ve decided to start a bi-weekly mailbag in which we will answer any questions regarding USC basketball. Want your question to be answered in the next one? Email galencentralblog@gmail.com, and we’ll be happy to help! Now, the interesting thing is, USC season-ticket holders are counted as part of the attendance every home game. Even if you are a season-ticket holder and you don’t show up to the games, you are still counted as part of the attendance total. The attendance number is based on tickets sold, not how many people actually show up to the game. USC isn’t alone in doing this either; most professional and collegiate teams do the same exact thing. Similarly, like most programs, USC does not disclose the number of season tickets they sell. So the reasoning behind the low crowds is simply that most casual fans or USC students haven’t wanted to spend a night at the Galen Center and watch a subpar basketball team play. With the Enfield hire, USC basketball is expected to be much more exciting this season, which should in return garner larger crowds. Unfortunately, we do not know the exact number of USC season ticket holders, but we hope our answer still helps! Omar Oraby will not be dunking or slamming in lobs in transition, but he still fits in certain parts of Enfield’s scheme. In order to start a fast break, you need a big man to rebound and outlet the ball. People also have a misconception about Enfield’s system in that his teams only throw lobs and score fast in transition. If the team is unable to score immediately, the team still needs an offense to score in the half-court. At 7-foot-2, 270-punds, Oraby will be a valuable post presence in the half-court offense. He will play a significant number of minutes this year as the only true big on the roster, especially if his conditioning has improved. With Dewayne Dedmon gone, there are more minutes available for big men. Gavrilovic is still pretty skinny, but he has improved his athleticism and should be a bit more physical. His game is still more about stretching the defense, and Enfield said that he wants a system where four players are on the perimeter and one is inside, which should be Oraby this year. Gavrilovic will need to be more consistent with his outside shot and play better defense against stronger forwards to get more playing time. 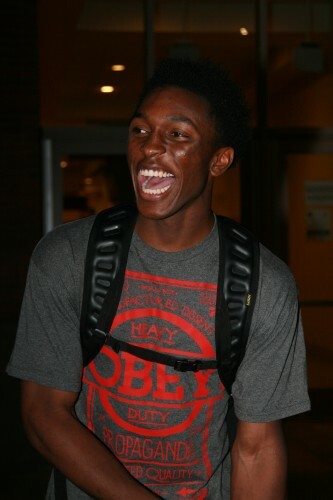 Stanley Johnson has obviously cut his list to eight schools, but the names you keep hearing are USC, Arizona and Kentucky. He told us he would not sign until the spring. That uncertainty puts a lot of pressure on coaches, so USC can hope that Arizona and Kentucky offer/get commits from other small forwards, which would influence Johnson’s decision. However, Johnson is the only small forward Kentucky has made an offer to thus far. That’s why he’s very high on Kentucky and why the Wildcats have to be considered the favorites to land him at this point. USC’s location, Enfield’s willingness to let Johnson be the go-to guy from Day 1, and Johnson’s longtime relationship with assistant coach Tony Bland are USC’s biggest advantages. We recently spoke with the marketing department. There will be a preseason event featuring scrimmages with both the men’s and women’s teams, and fans can meet the players and coaches. Other exciting promotions are still being finalized. We will keep you posted on all of the marketing efforts. Practices can start on September 27, since the NCAA changed its rules to allow teams to begin practicing two weeks earlier this year. As of now, none of the practices will be open to the public, but we will let you know if that changes. Thanks for your efforts to provide insight into the USC basketball program. With coach Enfield at the helm, it is really an exciting time to follow USC basketball. His fast paced style will provide a much more entertaining product than we have seen in recent years. I hope the fans come out and support this team. Thank you Gary! It should certainly be an exciting season.